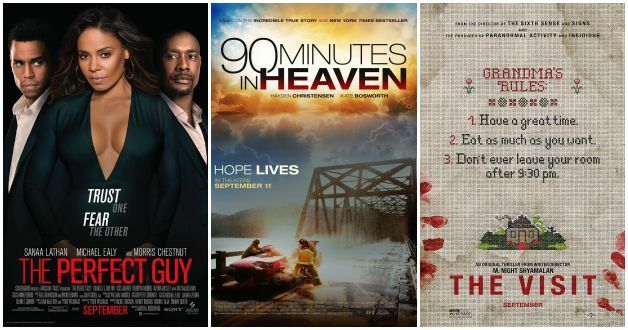 This week at the movies, Hayden Christensen spends “90 Minutes in Heaven,” Grandma goes a little crazy during “The Visit,” and Michael Ealy turns out to be “The Perfect Guy.” Or does he…? Limited release movies include “The Challenger,” “Sleeping With Other People,” “Time Out of Mind,” “Meet the Patels,” “A Brilliant Young Mind,” and “Breathe.” Let’s take a closer look at the new movies in wide release. 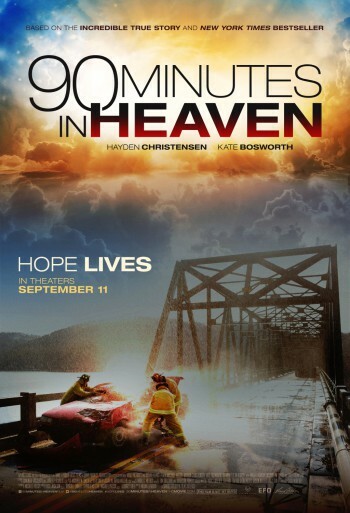 Based on the incredible true story and New York Times bestseller, this movie follows the life of Don Piper (Hayden Christensen), who died Jan. 18, 1989 when a semi-tractor truck crushed his car. Declared dead by the first rescue workers to arrive on the scene, Don’s body lay under a tarp for the next 90 minutes. His soul, meanwhile, was experiencing love and joy like he’d never known before – in Heaven. When a pastor’s prayer helps bring Don back to life, he becomes a living miracle, but also experiences pain and emotional turmoil. With the support and prayers of his beloved wife Eva (Kate Bosworth), their three kids and friends near and far, Don clings to his faith in God and fights to regain a semblance of his previous life. Directed by Michael Polish, this inspiring movie also stars Dwight Yoakam, Elizabeth Hunter and Fred Thompson. You know how it is. You take a trip to Grandma’s house and it’s all fun and games until you sneak out of your room after 9:30 p.m. Then all bets are off. Director M. Night Shyamalan returns to his roots with this terrifying story of a brother and sister who are sent to their grandparents’ remote Pennsylvania farm for a weeklong trip. But when the kids discover that the elderly couple is involved in something deeply disturbing, they realize their chances of getting back home are slim to none. Kathryn Hahn, Ed Oxenbould, Deanna Dunagan, Peter McRobbie and Olivia DeJonge star in this creep-fest. Leah Vaughn (Sanaa Lathan) has the ideal life. She loves her job as a successful lobbyist, and her longterm boyfriend loves her. But he’s commitment phobic, so instead of moving on to marriage and a family, the pair break up. Enter Carter Duncan (Michael Ealy), a handsome and charming stranger who quickly begins a relationship with Leah. In fact, he’s the perfect guy! Or maybe not. His possessive nature morphs into something more sinister, and Leah breaks things off with him. That’s when things get nasty. Directed by David M. Rosenthal, this movie also stars Kathryn Morris, Charles S. Dutton and Rutina Wesley. Previous articleDear GH: We Need to Talk – Who Wants Sonny Dead? Thanks for sharing. Keep posting!